According to Skycam CTO Steve Wharton, the three weeks after a Super Bowl are usually a time when he and his team can take a breath. That’s not the case this year. This weekend, they will be at full speed, beginning production efforts on the Alliance of American Football (AAF) season, with dual Skycams used for all 43 games: four games a week for 10 weeks, two playoff games, and the Championship on April 27 at Sam Boyd Stadium in Las Vegas. And, as if the AAF games aren’t enough to keep Skycam busy, there is Red Bull Crashed Ice in Boston on Feb. 8 and 9, Showtime boxing in California on Feb. 9, and preparations for next weekend’s NBA All-Star game. 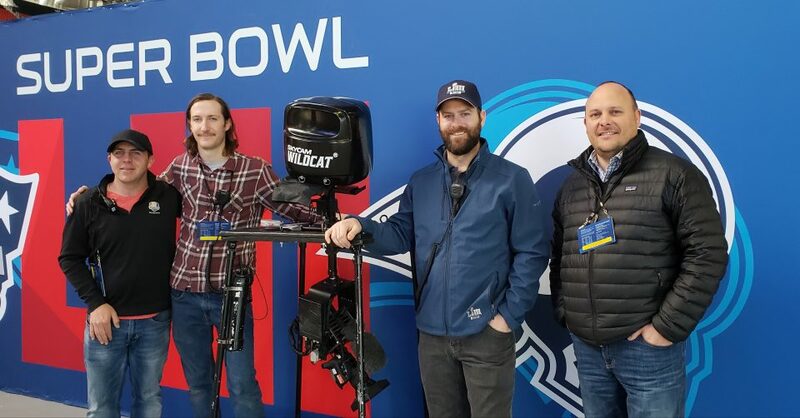 SkyCam’s team at Super Bowl LIII (l-to-r): Eric Van Gorp, Robert Smith, Jacob McGrath, and Steve Wharton. The four teams out west – the Arizona Hotshots, Salt Lake Stallions, San Antonio Commanders, and San Diego Fleet — are close enough to keep latency well within 100 ms. The four teams in the East — the Atlanta Legends, Birmingham Iron, Memphis Express, and Orlando Apollos — should have no more than 80 ms of delay.